Currently in hiding, the Black Death, or something like it, could re-emerge at any time, and with today's highly mobile community the consequences would be catastrophic. 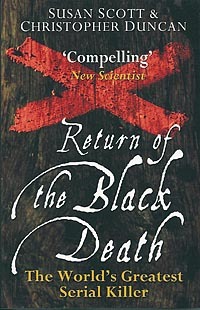 The Black Death was the most terrible and notorious serial killer of all time. It appeared out of the blue in Sicily in 1347 and went on to kill half of Europe in three years. In London it claimed 6000 lives a week at its peak - but a few years later it disappeared as suddenly and mysteriously as it had arrived. Using original parish registers, wills and diaries, Susan Scott and Christopher Duncan uncover the tragic and moving human stories behind the records: unsung heroes, bereaved parents, parted lovers and those who exploited the suffering for their own greed. Through careful detective work they reveal the real cause of the terrible plague and discover some surprising and disturbing truths. These plagues were not, in fact, Bubonic Plagues spread by rat fleas, but were the result of highly infectious and lethal Ebola-like viruses transmitted directly from person to person.